If you’ve heard the story before, you should know it lives on. Experience Montreal moments the way they were intended. Construction of Holy Trinity Methodist Church. Thriving Commercial District. With the end of the nineteenth century and changing lifestyles of the upper class, the bourgeoisie begins to settle on St. Laurent between Sherbrooke and St. Antoine — a celebrated commercial district melding both residential and professional life. Multicultural Influx. Waves of immigrants to St. Laurent Blvd. further shift the area’s social and cultural landscape. This greatly contributes to the multicultural flavor of The Main and its surroundings. 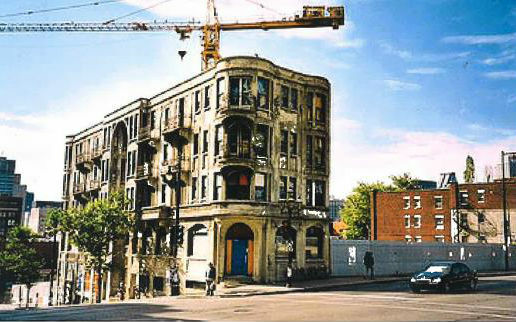 Construction of Canada’s First Residential Art Nouveau Building. One of Canada’s first residential Art Nouveau-style buildings—Edifice Godin designed by Architect Joseph Arthur Godin—is built on the slope of St. Laurent Blvd. Featuring pale-coloured, unconventional, stylistic concrete with arched entrances and windows and cantilevered balconies with iron balustrades, its design is reminiscent of French architectural style of the early 20th century. The Edifice Godin was said to have reinvented urban dwelling in Montreal, inspiring the architect to take his avant-garde approach still further, designing other residential spaces just a stone’s throw from theatres, universities, and shopping districts. Hellenic Occupation. The Greek community begins weaving strong ties with St. Laurent Blvd, and purchases the Methodist Church, which becomes Holy Trinity Greek Orthodox Church. The presbytery is the site of the Socrates Anglo-Greek School. 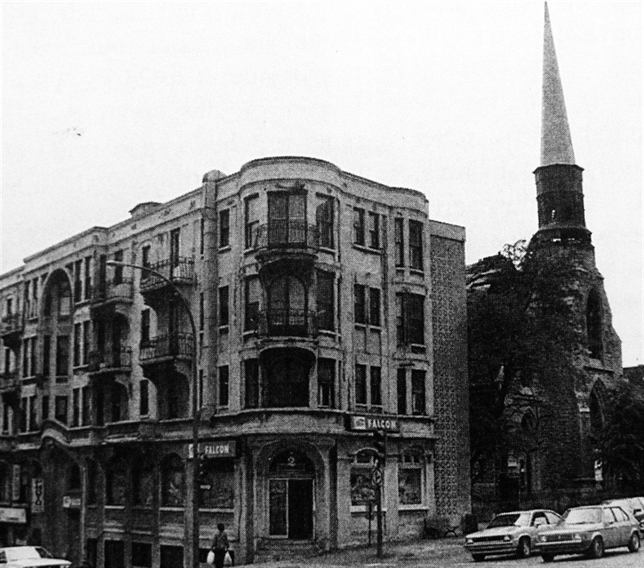 The Hellenic Community purchases the land on which both the Godin building and the church sit. The Godin building houses their offices. A large segment of the Greek community sets up shop north of Parc Avenue, leaving the Godin building unoccupied. Fire ravages Holy Trinity Church, and it is later demolished in 1997. Recession and the creative invasion. The economic recession of the early 1990s meant a “change of scene” for the Godin building, and a new creative vocation as an “artists’ commune”, housing musicians, sculptors, designers, and photographers. Suite 2116 - André "Dédé" Fortin. It was here, in the early 1990’s, on the third floor of the Édifice Godin, that Les Colocs was born. With the help of several fortuitous meetings, André “Dédé” Fortin, lead singer of the group, gathered musicians one-by-one and founded a group that had a profound impact on the 1990’s music scene in Quebec. André “Dédé” Fortin and his musical legacy remains a major influence for Quebec musicians into the 2000’s. On May 8th, 2000 André “Dédé” Fortin took his own life. To transform this tragic event into a constructive project and to continue the work of the beloved Quebec artist, his family created the Dédé Fortin Foundation in his honour to support suicide prevention and mental health disorders. As tribute to the work of Dédé Fortin and to the mission of the foundation bearing his name, HOTEL10 transformed a suite, renaming it Suite 2116, to immerse guests in the artist’s creative world. HOTEL10 will donate 10% of each night’s stay to the Dédé Fortin Foundation. Learn more about Dédé's story here. Economic recovery leads to the Edifice Godin’s renaissance. 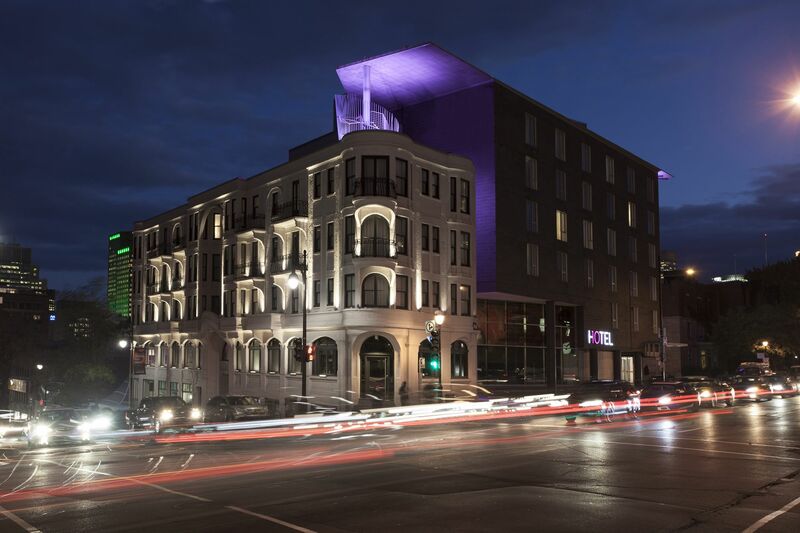 With the economic recovery and an upsurge of high-end restaurants, nightclubs, and trendy spots along St. Laurent Blvd., investors begin to imagine a boutique-style hotel that would serve as a “gateway to Montreal’s SoHo district”. The “artists commune” of the early 90s infused the lower Plateau with a bohemian charm that inspired a much desired romanticism. The Godin building quickly became a coveted location once more for the commercial opportunities that it offered. It was cleaned up to attract a corporate clientele and young professional types. Edifice Godin Expands. Architect Dan Hanganu enters the picture and is commissioned to retrofit the existing building by expanding into the site of the former Holy Trinity Church. With a post-modern approach, Hanganu aims to create a relationship with the site’s surroundings by developing an architecture that reflects our contemporary existence with its contrasts and contradictions. The design for the expansion of the Edifice Godin — described as using a “big box” strategy, while providing a “surprising dramatic interior”—holds no resemblance to the original building apart from its traditional grey-stone exterior. The Historic and The New. 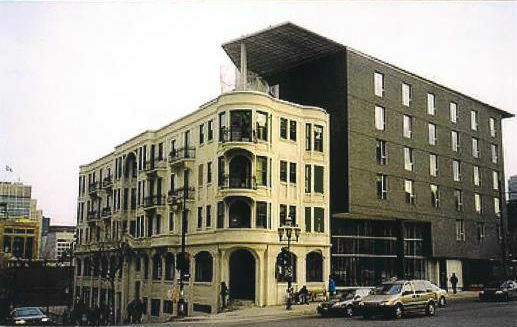 The historic and the new now stand side by side, their walls adjoin under the cantilevered roof that extends in a sheltering and inclusive gesture, marrying the two structures now known as Hotel 10. The complete opposite of the Edifice Godin, the new extension, which is the epitome of modern design, is now turning heads. Decorative raw materials are used throughout, walls lined in quartz and wooden beams, granite-tiled floors and pillars, large glass surfaces, concrete columns, giant symmetrical panels of polished marble, and the aesthetic use of metal wire all come together harmoniously to dress the interior. At the heart of the two structures, Espace Godin –named in honour of Joseph Arthur Godin– strikes a balance between the two styles, with its modern New Age décor and the Art Nouveau illustrations that cover the walls. The food and beverage space was developed to cater to private functions, as well as hotel guests—offering them a place to eat, drink, and relax. This multi-purpose space can seat up to 130 dinner guests and features one of Montreal’s largest and most sought-after outdoor terraces. It is spacious enough to accommodate high-capacity events, yet its layout is equally suitable for smaller and more conventional gatherings, offering several intimate and comfortable spaces.